His list of the ten best films: Up in the Air (George Clooney goes around firing people), Trading Places (Eddie Murphy and the commodity markets), Chinatown (Jack Nicholson at his film noire best), The Social Network (Facebook before the IPO), Glengarry, Glen Ross (more uses of the f-word than any other film of any genre, and a superb all-start cast uttering them), Inside Job (the Oscar-winning documentary about the 2008 meltdown–I made students watch it! ), Citizen Kane, Working Girl (this rom-com would not have been on my list, but…), The Godfather (“its’ just a beezeness, Michael”), and There Will Be Blood (with a truly chilling Daniel Day-Lewis). It’s quite a list. Johnson opines that perhaps the reason Hollywood so often portrays businesses and businesspeople in such a bad light is the experiences that directors, actors, and other creatives have had with studio executives. An interesting thought, yes? 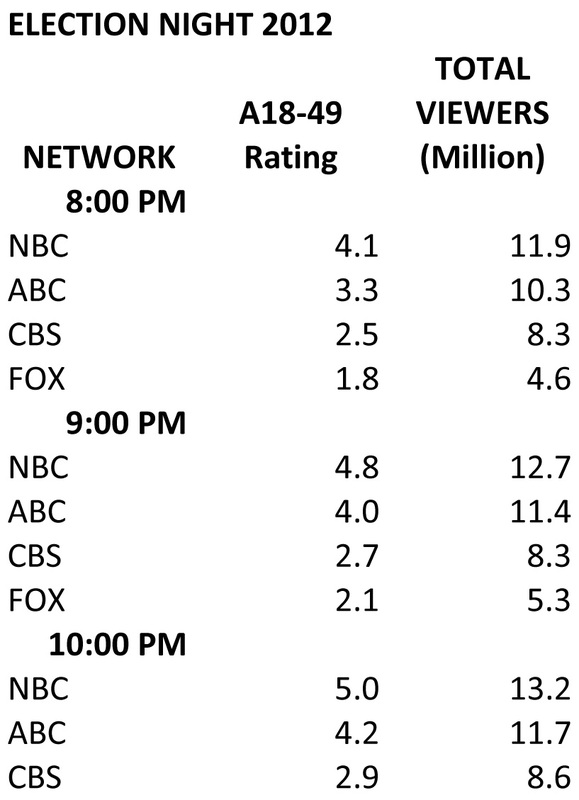 Above are the overnight ratings for the “big 4” networks for election coverage last night. NBC is the clear winner. So, who do you think was watching the networks, in terms of their demographics and psychographics–especially their political leanings?